Starting when a Tamagotchi is a teen, every time you feed it, the teen accumulates points towards becoming each adult based on the type of food it is fed. When it evolves, it turns into the character with the most points. If two or more characters have equal points, the adult is randomly selected from the ones with the highest points. The hunger is the amount the hunger of the Tamagotchi went down by eating the food. Usually this value is the same for each food, but if the teen is fed when it is almost full, it will be lower, because the food does not increase the hunger meter as much. Note that the training course must be placed to gain any points for Gozarutchi (the secret character). 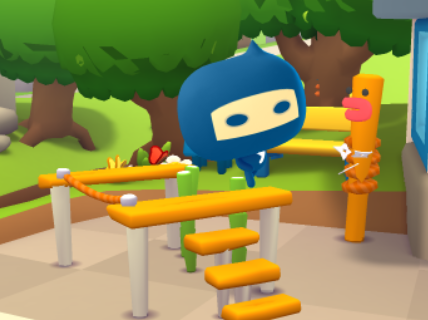 Becoming a ninja requires training!